I am revisiting this wonderful recipe. My late Mum had made this many times, especially when there is Ipoh Hor Fun around in the house. This should be properly called in Cantonese "Ipoh Kai See Hor Fun" (Shredded Chicken Flat Noodles - hmmm, it just don't sound right when translated). The soup is basically a chicken-based stock with some prawns flavour added through the shells. 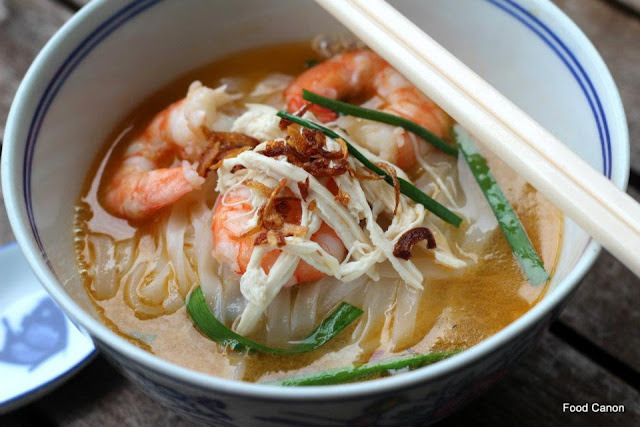 The tasty light broth accompanies the silky smooth hor fun very well, along with strips of chicken meat, slices of prawn, chives and bean sprouts. If you are an "Ipohan", you would have been to Kong Heng Coffeeshop. The Kai See Hor Fun there is the best in Ipoh and we can assume, has no other worthy challenger on planet earth. If you live in Ipoh, you have no reason to cook this at home. Just hop over to Kong Heng. This recipe is for the rest of us. More Ipoh eateries have open here of late and I hope you can find some good versions of this here, even if it is a far cry from Kong Heng's. The springy Ipoh Hor fun is still not sold here in Singapore, and I was told this is because our health authorities have banned a substance used in making it. You will have to make do with the local version (some stalls sell it as "Ipoh hor fun") but there is nothing stopping you from making a tasty broth. It is not difficult at all, especially compared to my Mum's Penang Hokkien Mee. This is a good recipe to start with if you are not used to preparing a broth and cooking Chinese noodles. Peel the prawns and devein. Remove some breast meat from the chicken and reserve it for garnishing later. Add the rest of the chicken, soy beans, some salt, sugar and simmer. Meanwhile in a wok or pot, fry the prawn heads and shells in two tablespoon of oil till they turn golder in color. Then add to the pot of stock. Later, this will impart a layer of red oil at the top of the stock. Finishing the broth: Taste and adjust with more sugar or salt. Chicken stock concentrate is optional if you have used enough chicken and the stock is tasty. Note that powdered chicken stock is salty by itself. Cook the chicken breast meat for about 10 minutes in the stock. Tear them into thin strips randomly using your fingers. Don't slice the meat. Blanched the prawn meat in the soup, remove and after it has cooled, slice the prawns into two halves (see photo). Cut chives into 1 inch strips. Blanch. Blanched a portion of hor fun and bean sprouts in a pot of boiling water for about 5 secs, then into the boiling broth for 5 secs and then put it into a bowl. Add a few pieces of the cooked prawns, chicken and chives. Garnish with fried shallots and serve immediately. Remember the small plate of tau yu (light soy sauce) with cut red chillies. Chicken meat will impart more flavour to the stock then just bones alone. If you like a good soup, don't stinge on your chicken. I prefer to use a large whole "Kampung" chicken to make the broth. One thing which you should NEVER do is to use commercial chicken stock liquid as a base for this soup. The soy beans will thicken and give more body to the broth. Skip if you do not have it. Traditionally, the prawn shells are not crushed, unlike Penang Prawn Mee. This results in a light broth where the umami taste is more subtle and play a secondary flavouring role. You can however choose to crush the fried prawn shells for a more robust broth. This will make your broth cloudier and add a redder oily sheen to it. Note: Even without crushing the shells, the broth will still have a red oily sheen. Fried onions/shallots is mandatory for this dish! Diced spring onions can also be added. Note: I have blogged a dry sauce version of this. We met at Leslie's place on Friday. Your broth was light & good. The recipe as per your blog was what you did for the broth we ate that day? Seems so simple. No garlic, ginger, etc. involved in the broth? Thought of making this broth and go together with some kway teow or noodles for my daughter when she starts school on Monday. It is really that simple as per the recipe here. Do try it out and see whether it works for you. There are some further steps like getting the right prawns etc if you want to perfect the stock but for a start, just try it out and you should be able to get a satisfying soup going. My family loves ipoh hor fun and have 'studied' the way the famous old town hawker does his.. To make the kueh teow really smooth, after blanching in water, he runs some oil to mix in with the noodles. Its not healthy, but the texture of the noodles in your mouth is great. We also find that more prawn oil adds fragrance so we always make extra prawn oil.. I accumulate prawn shells for this dish..
Hi, I'm a Ipoh girl !! I can't find the Bean sprout in your noodle !! No bean sprout, not Ipoh Chicken noodle !! As long as we fry the shells of prawns with oil, it is ok unless we want to cook Penang Prawn noodle then we MUST Blend the fried shells with salt !! You are right, Ipoh girl, I missed out on the bean sprouts here. I do include them sometimes. As for prawns, often I do not blend the shells for this dish. But I find it is just yummier if I did. HI Terry,loved your post and we tried the exact recipe and the result was fantastic. Whole family loved the ipoh hor fun to bits. Now they are requesting me to cook the ipoh ma ta liu curry noodle for them. Since we do not go back to ipoh now, everyone (including me) misses the curry noodle so much. hope you will find time to try it :) cheers. Looks really authentic and love the colour of it too! So hard to find good Ipoh hor fun outside of Ipoh. This looks delicious! I really like prawns . So I think this chicken-based stock with prawns flavour added through the shells will be really yummy for me. Thanks for the recipe. My husband loves it and said I out-do myself with it! Haha. I tried your recipe today and it turned out very well. I love Ipoh Hor Fun and never knew it was so easy to make. Thanks for sharing. I did not crush the prawn shells. How do you do that? Do you just press the shells down lightly while in the wok or do you take them out and crush them more? Then you would end up with lots of bits of shell in the soup. I did sieve my soup before serving. Cooking char siew in my wok was not successful though. I had a hard time getting the burnt bits off. I have a non-stick wok. Have to try it again. The prawns can be crushed through the blender or u can just crush it using a wooden spatula by pressing it in the pot. But for this dish, I think not necessary. A nice clear broth works better for this. Yes, need to strain. As for Char Siew, don't use a non-stick wok if u want to sear the pork. Hard to clean and will damage the wok. Thanks Terry. We enjoyed the Ipoh Hor Fun again yesterday. I still have enough left for another meal but I'll freeze the stock. Three days in a row is too much! I'll have to try the char siew again, next time with the right kind of pork and in the oven. A bit of fat tastes better than no fat. Luckily, my wok is still intact. I thought I would have to throw it away! I've learnt quite a bit about char siew making from you. Thanks again. Yes, unless u have a good wok which sears well (by the way, a pan or pot can do it too), the oven is a better bet. The main thing is to find an easy way to do it so that it is something u may do for yr daily dinners. 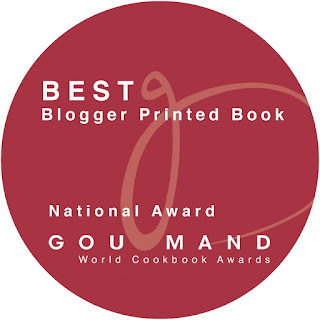 I think u run a foodblog and I linked yr post on my FB. Btw, re my comment above about my blog being for myself, it doesn't mean you shouldn't link up. That's fine. Thanks! FYI, I'm not sure if it's because I am typing on an ipad or what, but sometimes I can't go back and edit my comment (before publishing) and make changes, Just gets stuck and the only things I can do are either publish or delete. Has happened three times already. Hi, the Ipoh Sar horfun is yums. 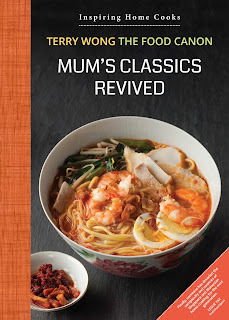 I've been trying to find a recipe that is similar to xin quan fang curry mee so that I can recreate it when I am not in Ipoh but cant seem to find any. Can someone help shed some light? Thank you! Yes, i have been working on this dry curry mee recipe. Will shed some light when I can.